veil. Associated fittings are made by a process of moulding using the same thermosetting resin types. Range of mechanical or chemical fixings. Fire retardant – materials tested in accordance with BS 476 Part 7. Conforms to BS EN ISO 14122-3:2001 Safety of Machinery – Permanent means of access to machinery. Part 3: Stairways, stepladders & guard-rails. Conforms to BS 6399-1:1996 Loading for buildings – Part 1: Code of practice for dead and imposed loads. Standard: steel grey or safety yellow colour. Resin type offers fire retardant to BS 476 Part 7. Operating temperature range -50°c to 105°c. 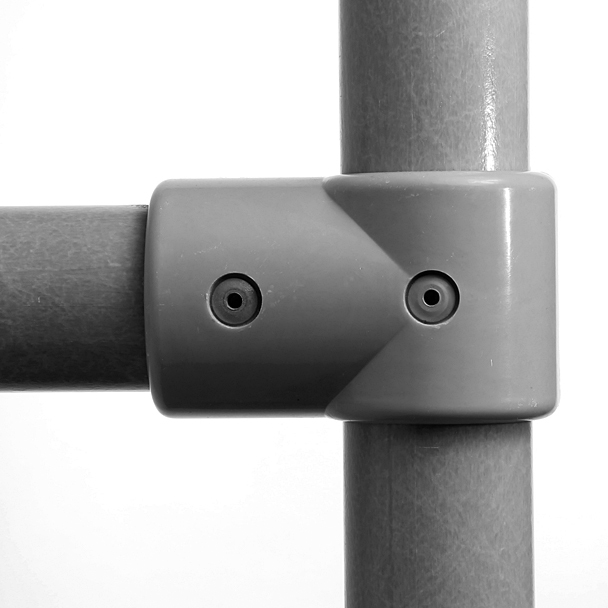 Rails are assembled by either plain or colour matched rivets or stainless bolt systems. Typical fixtures to concrete substrates are achieved using expansion anchors (stainless/galvanised or zinc plated) or chemical anchors. *Note: minimum order quantities & lead times apply. Please contact us for further information. Full specifications and performance data for this product range are available. 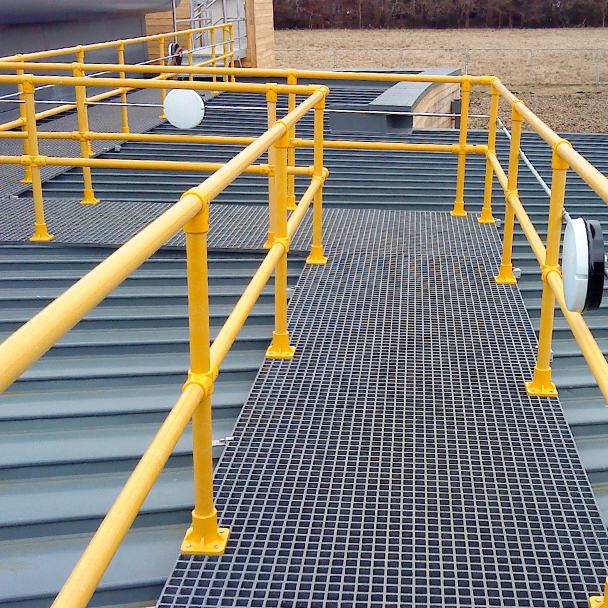 Glass Reinforced Polymer (GRP) handrail systems are perfectly suited to an interior, exterior and aggressive environments where industrial chemicals or acid/salt air may quickly corrode metal systems. Commonly incorporated into new build & refurbishment designs alike, they have shown proven in-service performance for 40+ years. For safety-critical applications, products are available which have been tested and approved to safety standards BS EN ISO 14122-3:2001 & BS 6399-1:1996. 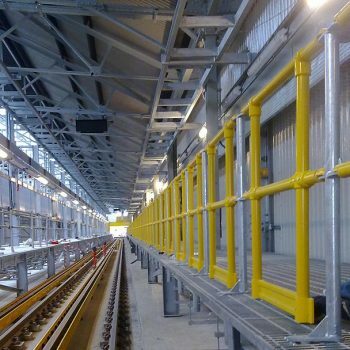 Rail systems are manufactured from glass fibre & polyester resins by a process of pultrusion with an applied surface veil. 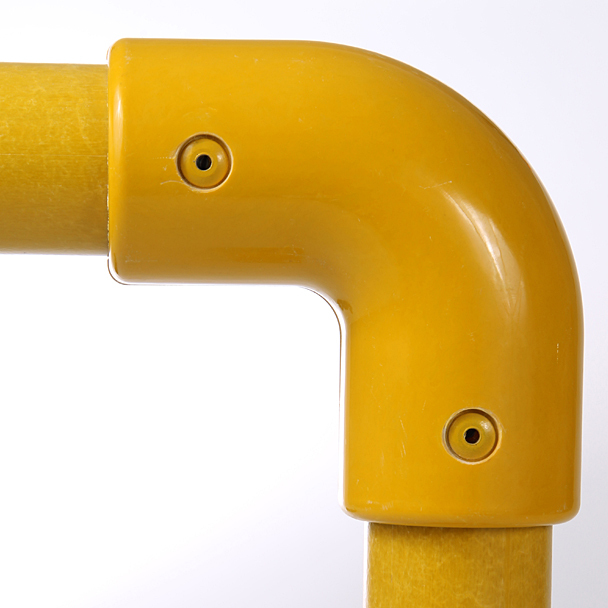 Associated fittings are made by a process of moulding using the same thermosetting resin types. 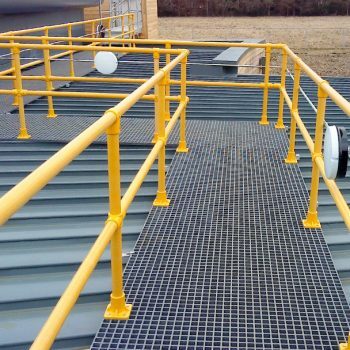 Available in high visibility safety yellow or steel grey, GRP handrails provide all the advantages of lightweight, high strength and durability, coupled with corrosion resistant, non-conductive, fire retardant and virtually maintenance free life. Through-colour construction and an optional extra-durable polyurethane surface coating will result in an enduring, smart appearance that is highly cost-effective when compared to stainless or galvanised steel/iron. The product provides for worker safety in a wide variety of exposed locations in all industrial and commercial environments e.g. water treatment works, marine applications, loading bays, walkways, guarding around machinery etc. The relative light weight of the product makes transport, handling & installation far easier than metallic products. 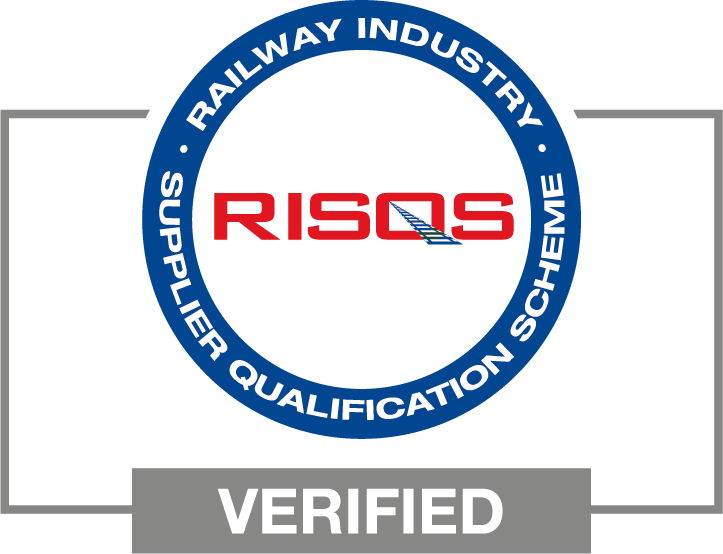 Rails may be cut to size and partially assembled prior to delivery for immediate installation, or easily cut in-situ using tungsten carbide tipped tooling and resealed using an approved resin top coat. A package of renewal, renovation works for end of life wooden structures and surfaces using GRP gratings and handrails.